With an earthen yet elegant design, this fine ceramic sake serving set is a perfect gift to match along with any tableware or special event. Featuring beautiful white cherry blossoms with red stems, this sake serving set is a speckled black and grey which mimics an earthen black alloy design. 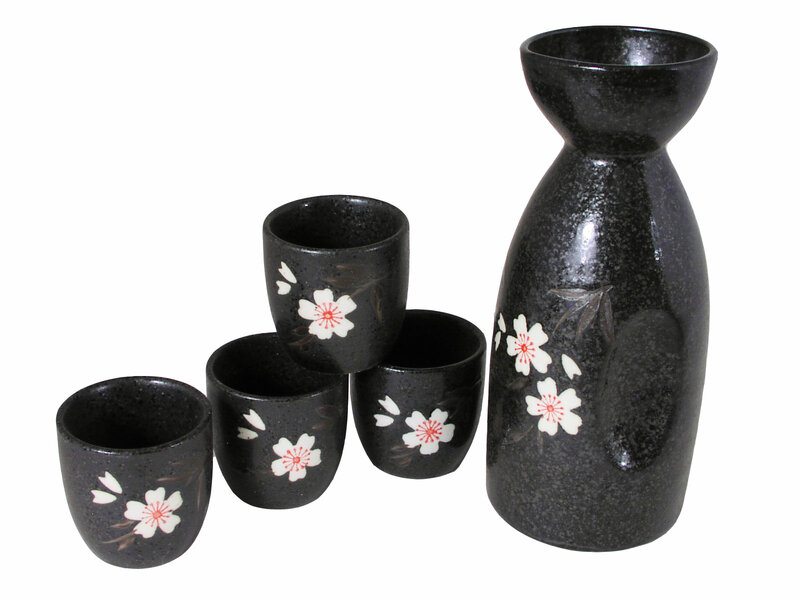 With a smooth paper-like finish, this lovely Asian sake set will make a statement in any home. Accompanied with four small sake cups to share your favorite sake with a small group of friends or family, the sake jug features a white round spout with a small lip for easy pouring. Large indentations on the side of the sake jug assists in having a better grip on the sake set when pouring as well. While the sake jug is long, the sake cups are round and small in size, perfect for taking small sips or taking a full shot in one gulp. Packaged in a beautiful paper gift box and ready to be gift wrapped, this sake serving set would make a great wedding and holiday gift for many sake lovers. Hand washing is recommended for this item.